HCMC Party Committee Secretary Nguyen Thien Nhan yesterday led a delegation to visit Pou Yuen Vietnam Company, subsidiary of Taiwanese Pou Chen Corporation. After visiting the company’s production line, Mr. Nhan had a working session with company leaders. At the working session, CEO of Pou Chen Group Tsai Pei-Chun thanked the Vietnamese Government for supporting and helping Pou Yuen Company during its investment and development process in Vietnam, affirming that the company will continue seriously abiding by Vietnam’s law and well doing social work. On behalf of HCMC leaders, Secretary Nguyen Thien Nhan appreciated development steps of Pou Yuen Vietnam in Binh Tan district. 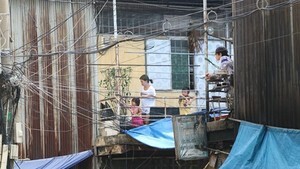 Pou Yuen is one of foreign firms attracting lot of workers in HCMC. The company now prepares for functioning a new production line with automated technology so it need to determine labor quality and scope in the future, coordinate with HCMC to solve labor demand problems and reasonably calculate labor measures after running the new production line. Mr. Shij Zhij Hung, Pou Chen Group’s director in charge of Southeast Asian market, said that automation did not aim to reduce labor force but to improve productivity, output and value of made in Vietnam products. Those who are working for the company will be trained to improve skills and fluently operate machines. Those unable to catch up with the automation process, the company will have suitable and lawful policies to protect their rights. 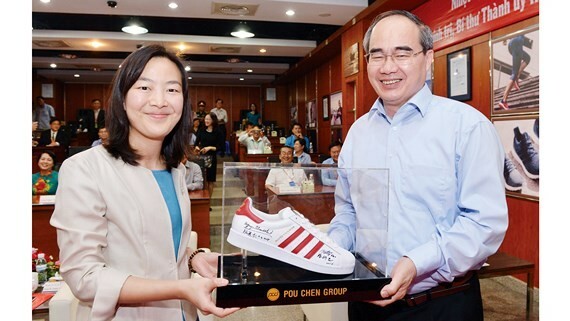 Pou Chen Corporation is a leading footwear manufacturer in Taiwan and the largest branded athletic and casual footwear manufacturer in the world. Products which the company manufactures on an OEM/ODM basis for global brand names account for over 20 percent of the world’s market share. Last year, the corporation made 325 million pairs of shoes with the revenue of US$6.3 billion. Starting business in Vietnam in 1994, Pou Yuen has expanded production to six provinces and cites including HCMC with ten plants, providing jobs for over 160,000 Vietnamese people. Binh Tan district, HCMC is home to its four large factories with 90,000 workers making shoes for well-known brand names.